Diabetic Shoes: Which Shoes Should Diabetics Consider? What Type of Shoes Should Diabetics Consider? I have always been mad about shoes and was initially devastated to learn after being diagnosed with diabetes that I might have to cull my rather extensive footwear collection. There might not initially seem like an obvious link between blood glucose levels and what shoes you should wear, but with the risk of diabetes-related damage to feet being caused or exacerbated by inappropriate footwear, it’s something you should be aware of. Your diabetic healthcare team might already have mentioned that diabetic foot care is an integral part of your diabetes management. However, did you know that even a minor callus, blister or corn could result in severe damage to your feet and possibly even the loss of your leg? Now think back to how tight-fitting dress shoes, heels, peep-toes, and strappy sandals can cause these simple issues. We’ve all limped through a special occasion desperate to leave and kick off uncomfortable shoes. Think about the damage a couple of hours wearing the wrong shoes can do and you can start to see how vital your choice of footwear can be. What Makes a Good Shoe for Someone With Diabetes? Avoid anything with a pointed toe or any form of restriction on the “wiggle room” for your toes. A rounded toe with a generous “toe box” area would be ideal. Make sure your shoes fit. 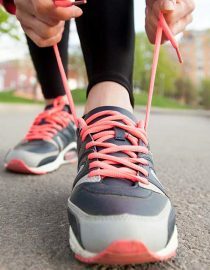 This might sound obvious, but one British study found that 6/10 people with diabetes were wearing the wrong sized shoes. Go to a store offering free fitting from trained staff and remember that even if you are one size in one store, you may well be as much as a size either side with other brands or stores. Make sure they check the width as well as the length of your feet. Feet often get wider with diabetes and with advancing age and shoes you used to be able to wear comfortably are no longer suitable. If you are tempted by off the shelf bargains with no option for a professional fitting, turn the shoe upside down and put your stockinged foot on the base to see how much room you have around your foot. Or even better, see if the insole comes out and stand on it to check you have wiggle room. Shoes that are too big are as bad as those that are too small as shoes which slip-slop can create blisters which can quickly turn to ulcers in diabetic feet. Opt for genuine leather whenever possible, or a soft manmade material which will give with the shape of your foot without creating pressure points. Shoes with fabric uppers that stretch and memory foam soles can be a good choice if you have no signs of neuropathy (nerve damage). What Is a Bad Choice of Footwear for People With Diabetes? Shoes with heels which put pressure on the ball of your foot are not suitable for people with diabetes, especially if you already have a degree of nerve damage (neuropathy) as your foot sensitivity and therefore balance could be affected. Avoid shoes with thin straps and don’t wear flip-flops or open sandals which can easily let in grit or stones which can cause small cuts or blisters. Even a small cut or burst blister can quickly become infected on a delicate diabetic foot, so opt for the more practical closed front hiking sandals which are designed to avoid these issues or lightweight summer shoes made of a material which allows your feet to breathe without the risk of foreign objects entering and rubbing. Before buying shoes run your fingers carefully around the inside, checking there are no seams or rough areas anywhere where your feet will make contact. Try both shoes on and walk around making sure you can’t feel even a slight irritant which could cause big problems during long walks. Where Can You Buy Diabetic Shoes? A quick internet search will reveal lots of sites where you can buy shoes described as “diabetic.” Some stores do offer an orthotic range with wider or deeper fittings suitable for people with diabetes too. Many shoes suitable for those with diabetes are labeled orthotic which brings to mind terrible clunky designs for old people. Luckily nowadays even the most stylish people appreciate the joy and need for comfortable shoes, so there are lots of more modern and elegant styles available. If your feet have significantly changed shape since being diagnosed with diabetes or you suffer from any form of neuropathy, skin breakdown or other foot issues it would be wise to consult a medical professional for advice about shoes. Does Insurance Cover Diabetic Shoes? Podiatrists, orthotists and therapeutic shoe fitters will be able to source specialist wide or deep fitting footwear. You may even be able to get a prescription for these from your physician and have the cost covered by Medicare or other insurance companies. You will have to get your primary physician to sign a form stating you have diabetes and confirming that you need specialist shoes. Qualifying conditions usually include amputation of the other foot or part of either foot or a history of previous foot ulceration of either foot or history of pre-ulcerative calluses of either foot. Other qualifying conditions include peripheral neuropathy with evidence of callus formation of either foot or foot deformity of either foot or poor circulation in either foot. Check with your physician to see if you qualify under the terms of your insurance or if they know of any other way to help you get free diabetic footwear. What you are entitled to may vary depending on your insurance company. Medicare, for instance, offers one pair of depth shoes and three inserts each year. Whether you qualify for free shoes or not, podiatrists, specialist shoe fitters, and other experts may use inserts, arch supports or wedges to prevent further foot damage and improve balance. You might also like...What Does Insulin Do? And What Is It? It can be hard to kick off the heels or abandon slim fitting Italian style work shoes in favor of Velcro fastenings, wide fittings, and rounded toes but there are ways of maintaining your sense of style while protecting your precious feet. Ladies, embrace the maxi skirt or dress for smart occasions or choose loose pants for those occasions where a long dress would be too dressy, and you want to cover up you’re less than elegant footwear. Style boots with skinny jeans or pick elegant, timeless low or no heeled-style shoe and team with classic clothing pieces. Men, opt for lace-ups in polishable leather finishes for the office or look at some of the cool but comfortable ankle boots or on-trend deck shoe styles which look great with shorts. It might feel like you are sacrificing your style for the sake of your health but keep in mind even the ugliest orthotic shoes are more attractive than an amputated limb or ulcerated foot. Prevention of diabetic foot through good diabetic foot care is the best medicine for avoiding numbness, painful sores, and dangerous bacterial infections.